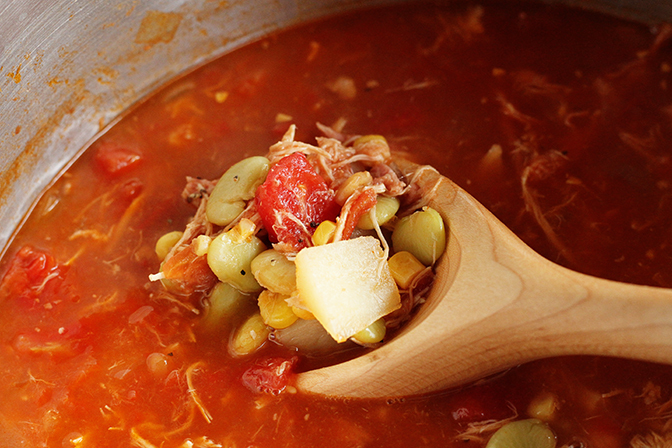 With the arrival of cooler weather, my cravings for hearty soups and stews return. I love hunkering down on a big bowl of deliciousness with a piece of piping hot cornbread in hand. 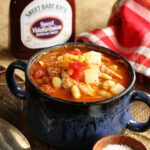 And one of my absolute favorite stews this time of year is Brunswick Stew or sometimes called Camp Stew around these parts. 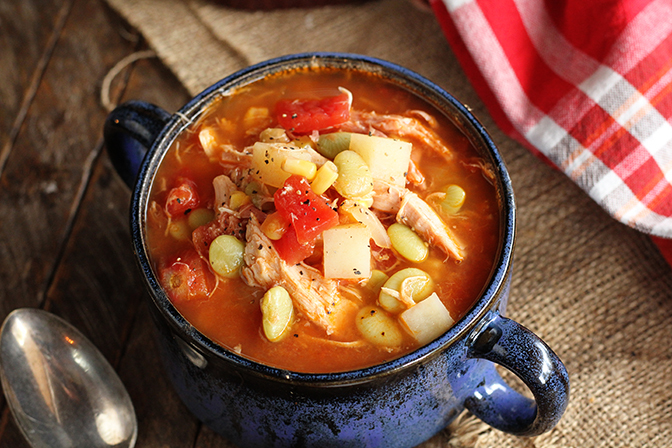 It’s a thick hearty stew of pork, chicken, tomatoes, lima beans, corn, and potatoes. And because it relies heavily on the smokey flavor of pulled pork, it’s sold in many BBQ joints around the South. And that’s why I’ve named mine as I have. But you don’t HAVE to run out to a BBQ place to get great stew. You can make it right at home. And with this quick and easy recipe, you can have it on the table in less than an hour! For real! 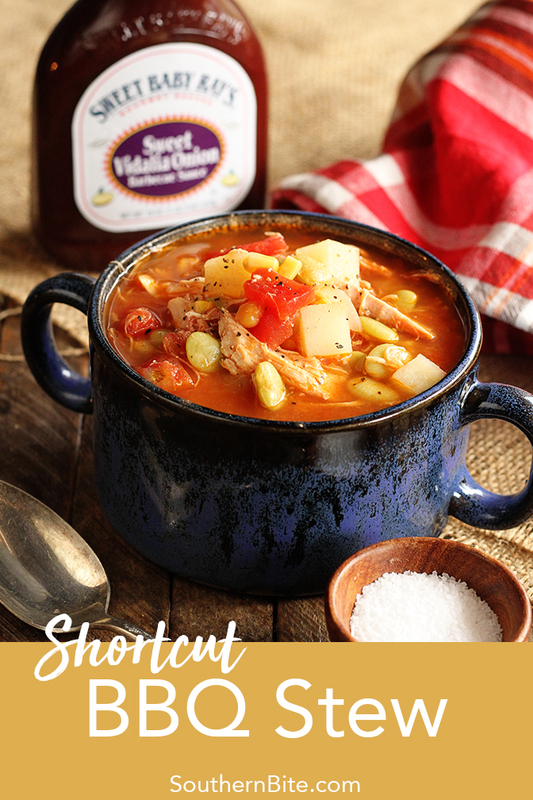 My recipe uses a rotisserie chicken and a pound of sauceless smoked pulled pork from your favorite BBQ spot as shortcuts that make the prep super fast without sacrificing any of the flavor. 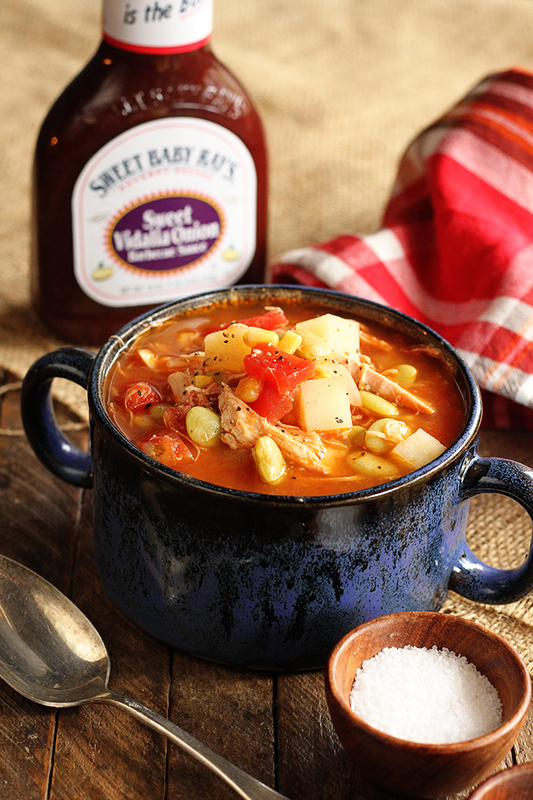 And there’s a sweetness found in most stews like this that is perfectly achieved by stirring in some Sweet Baby Ray’s Sweet Vidalia Onion BBQ Sauce at the end. It adds a delicious depth of flavor and that hint of sweetness it needs. And I love that this recipe freezes really well. It makes quite a bit and leftovers freeze perfectly for later in the season when you need a quick lunch or supper. Y’all are going to love this! Enjoy! 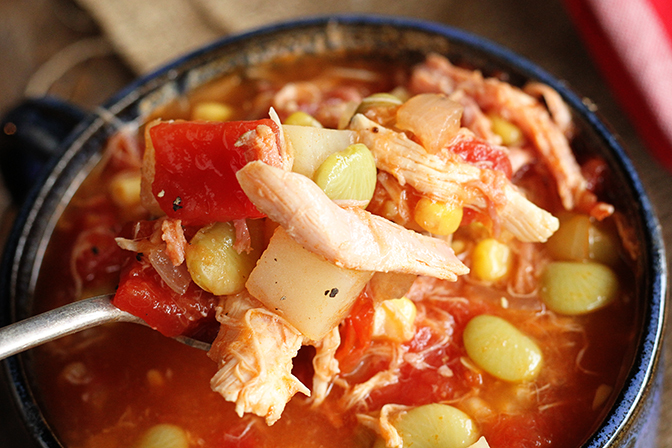 In a large stock pot over medium heat, combine the chicken broth or stock, potatoes, onion, corn, lima beans, and tomatoes. Stir well. Bring to a boil and reduce the heat to a simmer. Pull the meat from the rotisserie chicken and shred it. Discard the bones. Add the shredded chicken and the pulled pork to the pot. Continue to cook 15 to 20 minutes or until the potatoes are tender. Stir in the Sweet Baby Rays Sweet Vidalia Onion BBQ Sauce and vinegar and reduce the heat to low. Cook for 5 additional minutes, stirring frequently. Add salt and pepper to taste. Serve warm. It’s so good! Maybe one of my favs! Hope you’ll enjoy the stew! Wowee, you got a fancy new look!! Love it! Oh my, that looks so good. It reminds me of when I lived in Savannah. I think I’ll have to make a batch this weekend! Thanks, Melissa! Hope you’ll enjoy!! I made this last night…it’s great! Plenty of leftovers to freeze for later on! !